New Fiction on the Intertubes! My newest story, “Lamp of the Body,” is online at Bewildering Stories, edited by the indefatigable Don Webb. It’s set in a retrofuturistic Portland, the kind of city Portland would be if every building was Art Deco or Streamline Moderne. There’s a security cam on every corner and a cadre of unhappy inspectors watching the feeds. 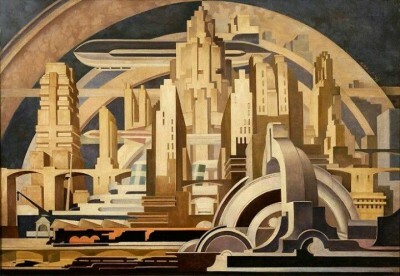 When I saw Tullio Crali’s Cityscape, I knew that was the city where “Lamp of the Body” took place. I hope you like it. It’s good to have some new material out there for people to read.